The goal of this Non-Profit Organization is to provide a Diabetic Alert Dog to a Type 1 Diabetes. Diabetic Alert Dogs aid and assist an individual with Type 1 Diabetes by detecting high and low blood sugars before a glucose meter can. Type 1 Diabetes is a chronic condition in which the pancreas produces little or no insulin. When looking to raise money to get my own DAD I ran into many roadblocks and had a rough time of it. It was during this time I had the idea of starting an organization, raise money for those in need of a DAD, that otherwise could not do it on their own. 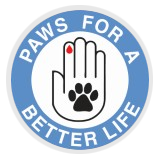 Paw’s for a Better Life was born in my mind about two years ago.